Consultations at The Children’s Clinic usually include appropriate skin prick testing for food and environmental allergens. We call it a “tickle test” – it does not hurt – it is a quick and painless procedure that gives instant results. Currently, the private labs in Christchurch do not offer this service. We are told that there is a 6-month waiting list to get tested at Canterbury Health Laboratories (CHL). We carry out skin-prick-testing on children once they get to 3-months old. 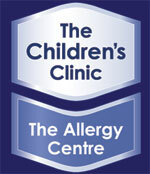 Any child with eczema or suspicion of food allergy should be tested.